From the point where the park meets the river, you can trace the path of the river by following a footpath and this leads you through the town center, with the monastery periodically in view on the hill to your right. Just before the point where you leave this route to head for the monastery you reach Monforte de Lemos's two other sight seeing highlights. The first is an old bridge, of which parts date back to medieval times and the second a former convent, now the town museum. 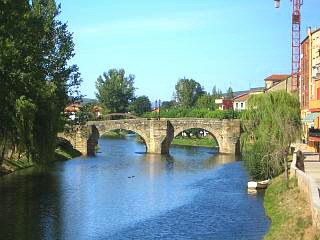 Monforte de Lemos's medieval bridge is formed by four arches with buttresses and spans the river Cabe at the central point of the town. In truth it is no more attractive than many bridges you will find scattered throughout Galicia and most do claim a medieval or Roman ancestor ship. Its appeal is however heightened when you look back to the new and ugly bridge from which the photo above and to the right was taken. And yes, the river really was as blue as it looks in the photo. If you cross the river Cabe at the medieval bridge you will walk towards three small old buildings featuring Galician galeria's (enclosed balconies) and between them you will see an old granite convent. 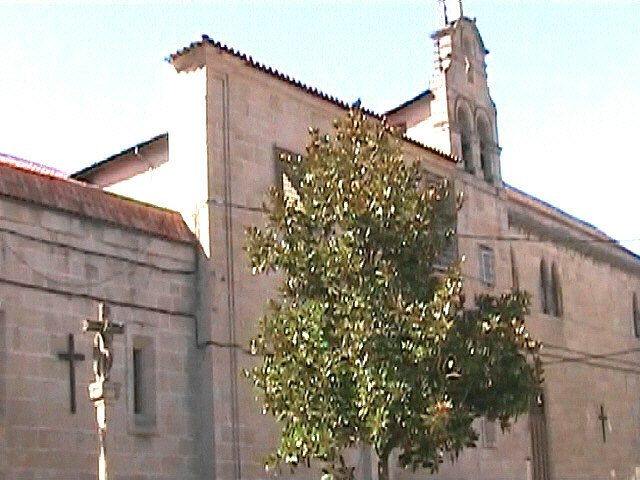 This convent (Convento de As Clarisas) is now a museum, but was formerly a convent of the order of Saint Claire. The convent was established in 1622 by Count Pedro Fernandez de Castro and the original construction on this site commenced in 1634. Today the convent is called the Museo de Arte Sacro and contains exhibits of art from Monforte de Lemos and the surrounding area. the cost of entering the museum was 2 Euros, but you could cross the bridge and look at it for free. Well the big attraction is the monastery on the third page of this guide, but Monforte de Lemos does have some bars and cafes along with plenty of shops. It also has sports fields (lots of them), tennis courts, a hospital and a few churches, some of which were quite attractive. Below a view from one of the cafes. My overall feeling of this place was that it was a genuine Galician town with no major concessions to tourism or anything else for that matter. It was not especially quaint or appealing and most of the town appeared to have been built some time during the last century. There was no old district or medieval quarter, but I liked it none the less and found the municipal areas, (parks and the like) to be clean, attractive and well used by the locals. 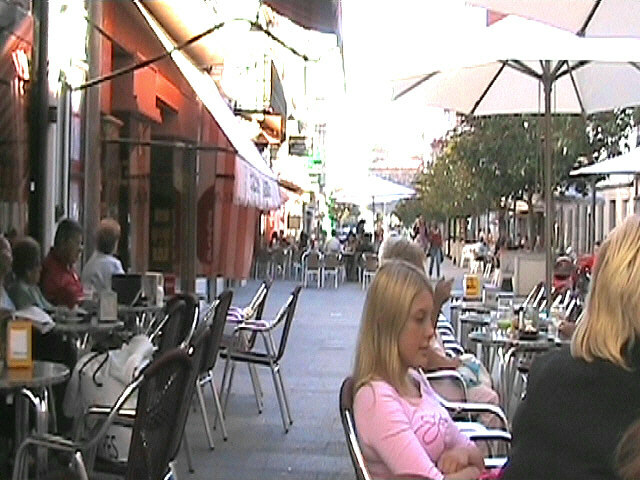 We also had a coffee, tea and snacks at one of the alameda facing cafes and found the food, service, cleanliness and cost to be excellent. We were also intrigued by the massive collection of mugs (big cups) which hung above the bar area and were apparently donated by locals and visitors from their various travels. Some were clearly from the UK and USA. Below and right, a couple more shots of Monforte de Lemos. 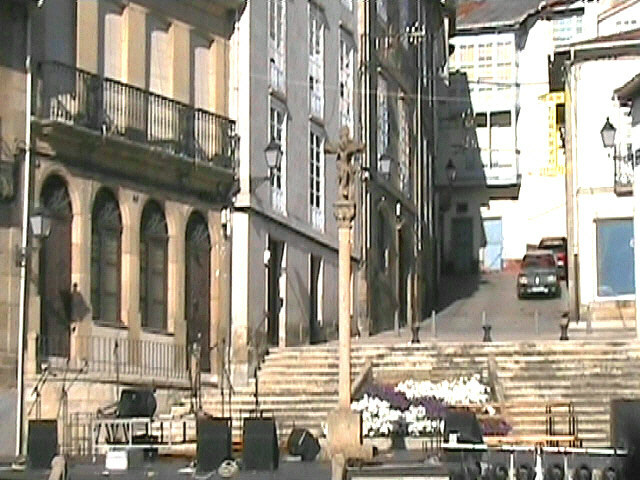 The first (right) shows a typical street with an old stone cross (cruceiro) in the center below the stairs. The second photo, (below) shows the view you get of the monastery from the convent (museum) on the far side of the river. 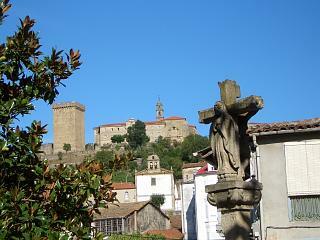 There is also the top of a cruceiro to the right and in the foreground of this picture. The museum is behind me as I take this shot and the medieval bridge is out of view below.